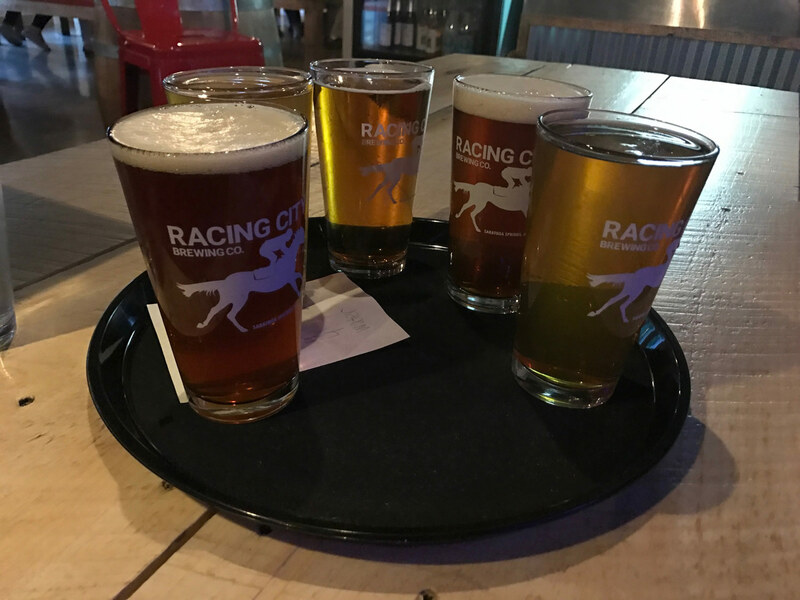 Our Beers - Racing City Brewing Co. The beers at Racing City Brewing Co. reflect our overall mission. While Racing City Brewing Co. may be new to Saratoga Springs nightlife, we’re not trying to fix what’s not broken. And that’s how we feel about our beers. We’re in a classic town like Saratoga and we’ll be brewing classic styles of beer with our own modern take in order to ensure not only a unique experience, but so that there’s something for everyone. Just like this town. See below for a list of the beers that we brew! DESCRIPTION: This Pilsner is on the farther end of Bohemian Pilsners with a deeper color and malty finish. A large addition of oats during mash provided a full body that is still crisp with a slight raisin taste that matches the spicy Saaz hops. DESCRIPTION: With the smooth base of Colt Classic, we had to give it a try on some barrels, further connecting to its Kentucky Roots. Aged in honey bourbon barrels to honor the Triple Crown provides a sweet, smooth, honey note along with subtle smoky bite of bourbon. Try this Derby Style by adding fresh muddled mint. DESCRIPTION: This is the American standard in beer. We took a cue from some great brewers that came over to America to provide us with clean, crisp, easy drinking lagers. Finding that sweet spot, we kept it simple with traditional earthy hops and a simple grain bill with a little bit of flaked maize to make it go down smooth. DESCRIPTION: Coupled with Summer Session, Session Entry was brewed with the same recipe with the addition of different dry hops. The Mosaic and Mandarina Bavaria hops have pushed this session into a tropical fruit paradise. These stable mates make for good drinking Session beers. HOPS: Green Bullet, Mosaic DRY HOP: Citra, Green Bullet DESCRIPTION: The half-brother to Session Entry; same recipe, different finish. The Citra and Green Bullet hops tend to provide a drier hop aroma with hints of dried fruit. These stable mates make for good drinking Session beers. DESCRIPTION: A double IPA, brewed with rye and red malts for a deep red color and malty backbone. Generous dry hop provides a citrusy floral character, like the strong characters of its namesake; three big red horses, Man o’ War, Secretariat, and Justify as well as the three breweries that collaborated on this beer. DESCRIPTION: A nontraditional lager that borrows notes of a cream ale. Mosaic and Centennial hops provide a tropical floral note. The use of flaked maize adds to the body, giving you a creamy mouth feel. First of an experiment in high pressure lagering, this hopped up lager yields slightly buttery notes. As a handicapper would say, it’s a top choice. DESCRIPTION: Not just an IPA, it’s Justif-IPA. In more ways than one, this beer never got to its planned conception; intending to brew a Double IPA, a miscalculation during brew day bred just an IPA. Named for Triple Crown winner, Justify, who also had a change in plans and retired due to an injury. A great list of hops adds bright notes of pine, stone fruit, and tropical flavors. With a medium body and toasty honey finish, this IPA proves to hold on for the Crown. DESCRIPTION: A deep amber hued IPA that has the tart bite of blood orange. A dry hop of Mandarina Bavaria helps add to the orange flavors which are evident but not overpowering. DESCRIPTION: Clean and crisp, this flagship pale ale is simple to its core. Light body with a spicy floral hop profile that subtly breezes over your tongue. The first beer to race out of our taps and it will continue to show up on the card. With a smooth finish, this easy-drinking ale is a great choice for the maiden craft beer drinker. We also offer Oliva Winery wines that are also made on premises. DESCRIPTION: This light sweet wine has the fragrance of an orchard with a big juicy peach flavor. Perfect for lunch or brunch or just relaxing on a Saratoga porch. Also enjoy this with barbecue chicken, spicy foods, tart fruits, and sharp cheeses. Its smooth finish is pleasing anytime. DESCRIPTION: This semi-sweet Riesling has a light golden hue with clean flavors of green apple and floral notes. Rieslings are a food-friendly wine, lending themselves to a wide range of potential food pairings, especially seafood, chicken and pork, spicy foods and desserts. DESCRIPTION: The Chardonnay grape emphasizes the high-toned, steely, fruitlike qualities of the wine. Off-dry with a crisp finish that will compliments olive, fruit and cheese and pairs well with seafood, poultry, and salads. DESCRIPTION: This distinct, dry red wine blend has a complex medley of dark berry and plum flavors while maintaining a medium body that provides a clean finish. Pair with a good filet, stronger cheeses, and of course, enjoy with your favorite pasta and meat sauce, or even pizza.